I don’t know if ‘Meh’ is actually a word as classified by the English Dictionary, but that is definitely the kind of week I have had this week. Not bad, not particularly good. Just meh. So so. Mediocre. Yesterday I panicked thinking that I hadn’t taken a single photo on my big camera this week, and hardly any on my iPhone either. This is quite unusual for me as if I haven’t taken many on my DSLR I normally at least I have taken lots on my phone, but it just hasn’t happened this past week. We went out to the most gorgeous little tea room yesterday and I took my camera, before realising that I had forgotten the memory card. Total fail. I was cross with myself, before actually stepping back and thinking that I shouldn’t force these things. The reality is I haven’t felt like taking photos this week. It’s been a really hectic one, we are in the midst of having our living room redecorated and as such it’s been a bit stressful with two small people needing entertaining while ceilings are replastered, electricians are rewiring and walls are painted. Our entire house has been turned upside down and although it will be more than worth it in the end, it’s been a long week. To top it all it’s been another one full of germs. Mads has had a poorly week, I have never felt her so hot as she was at the start, and she just hasn’t been herself. All she wanted to do was snuggle on the sofa and watch TV, but unfortunately because of the decorating that just wasn’t possible. Mr E came down with it towards the end of the week, and had to have a day off work which rarely happens and as I am typing this I am also feeling pretty out of sorts. Our TV and broadband also stopped working at the start of the week, which wasn’t ideal when you work from home and have a poorly girl who just wants to relax. But between the hecticness and the bugs, we have had some nice times. It hasn’t been tough, just not one of our best weeks. Just ‘meh’. The above photo was literally one of the only photos I took this week. It’s an iPhone jobby again, but I love it all the same. I find that while obviously I prefer the photos I take with my big camera, you can easily capture much more emotion and rawness using a camera that isn’t quite so in your face. After bathtime and story time, we cuddle. That’s just what we do. All four of us snuggled up in our bed having a cuddle. LL is getting so much more interactive nowadays and will now cuddle into you and say ‘Ahhh’. She loves bare skin and will often pull down my top so that she can lay next to the warmth of my skin. It’s very sweet. Mads loves to cuddle her sister. And we love to cuddle them both. So that’s what we do. And even when you have had a ‘meh’ day, wrapping your arms round these two little ladies before they go off to the land of nod makes everything feel instantly better. Oh i do hope you all feel better soon – no one wants to be feeling grotty without the lounge sofa to veg out on! It’s funny how picture taking comes and goes in waves too – although my iPhone pictures depend largely on whether there’s any space left on the wretched thing – I never thought how much I’d use it as a camera when I first got it! I have not used my big camera in ages! I feel I neglect it so much!! It just so handy having one you can easily pull out of your pocket! Sorry you’ve had such a ‘meh’ week (it definitely should be in the dictionary if it isn’t already). I hope everyone is feeling better again soon. Sounds like it’s been a stressful week! We ‘re starting the process of redecorating our living room and dining room soon and although I’m looking forward to them being done (finally!) I’m not looking forward to the chaos! 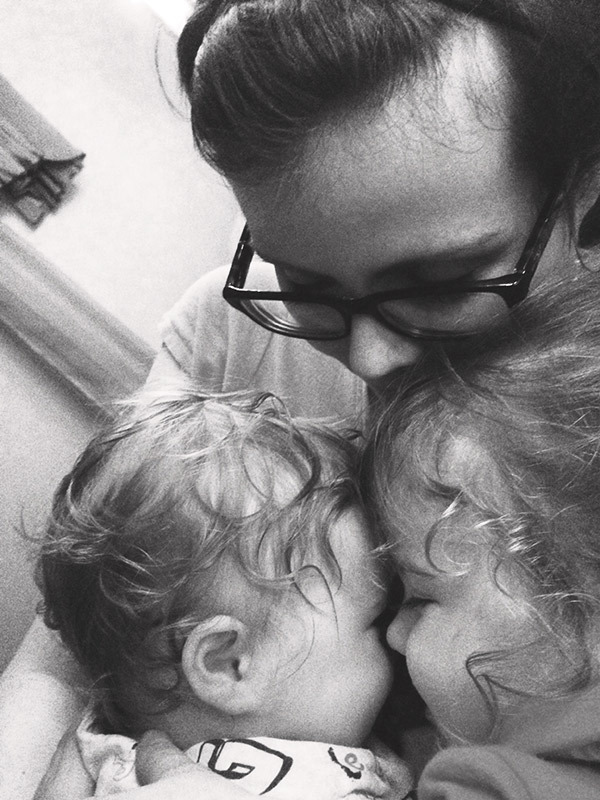 All that aside it’s such a lovely snuggley photo – love their whispy curls. Hope you are all feeling better soon and that the coming week is a better one for you all. I totally get what you mean by a ‘meh’ week, we have the here too. We’ve also been struck with illness here too as my little man has caught chicken pox, so lots of couch cuddles here. That’s an absolutely gorgeous photo, and very representative of parenthood – it’s not always fantastic fun and fireworks, it’s not always photo-shoot perfect. But it’s bloomin beautiful all the same. Cuddles are definitely the best part of the day! Nothing better than a cuddle with the kids, and I agree with you about the iPhone. Some of my best shots have come from there! Sorry you’ve had a “meh” week, but cuddles always make things better, and it’s so nice you got to capture one of those precious cuddles. Hope Mads feels better soon, and your living room turns out okay, and you find your way again. Love the picture! Ahhhhh i love the snuggles before bed that is just such a lovely little moment, must be so special for you all!! Definitely nothing like snuggles to make a ‘meh’ day better!!! Sorry you’ve all been feeling ill – I hope you’re on the mend now. And that is such a lovely photo – I love your girls’ curls! Katie I have no idea if Meh is a real word but I used it myself this morning to describe how I was feeling to a friend! It just sums it up very well I think!! Gorgeous photo – so much love and affection in that image.